Place chopped Snickers Bars into a bowl, set aside for now. Place graham cracker crumbs, sugar and melted butter into a mixing bowl to combine. Spoon a couple spoonfuls of crumbs into each section of the muffin pan and press down and up the sides. Bake for 5-6 minutes or just until browned. Remove from oven. In a stand or electric mixer, beat the cream cheese and sugar until smooth and creamy. Add in eggs and vanilla until well combined, scraping sides of bowl with a rubber spatula. Beat in caramel sauce until well combined. Pour about 1/4 c. of cheesecake mixture over each baked crust then top evenly with chopped Snickers. Bake for 23-26 minutes or until cheesecake edges are just starting to brown and centers are nearly set. Remove and let cool completely. While still warm, loosen all edges with a plastic knife to make for easier removal from pan. 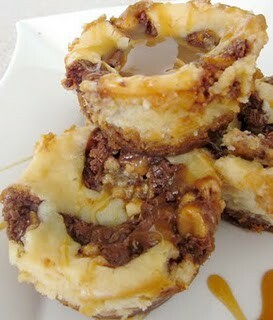 Refrigerate once cooled then top with caramel sauce and whipped cream to serve!